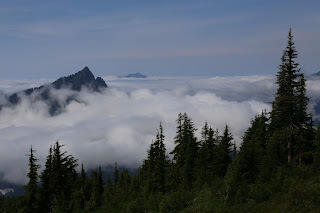 The climb up Mt Dickerman is quite vigorous, gaining 3875ft in 4.3mi. The trail is excellent, and covers a number of different climate zones. It culminates in a spectacular view in the heart of the Cascades. This is the only view that isn't entirely of other mountain peaks -- it's looking west out towards Marysville. Thick coastal cloud was a concern as we headed out, but fortunately we were able to climb above it.